Nexus devices will finally receive Android 5.0 Lollipop! 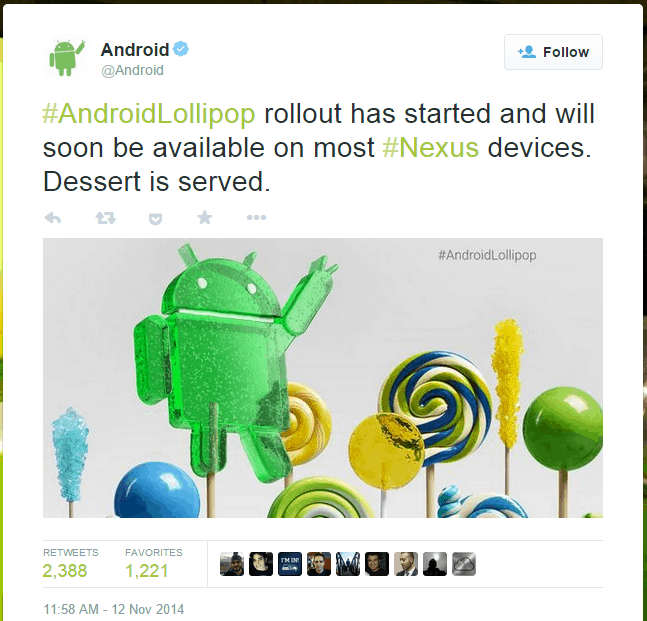 You are here: GeekSays Technology News » Android » Nexus devices will finally receive Android 5.0 Lollipop! After a lot of complaints, jokes, memes and playing the waiting game, the big thing happened: Google has started the deployment of their latest mobile operating system, Android 5.0 Lollipop to most Nexus devices, according to their official Twitter account. So, if you own a Nexus 5, a 2013 Nexus 7 or even the new Nexus 9, go ahead and check if the update is there. Who knows, you might have a surprise. Unfortunately, Nexus 4, Nexus 10 and first-gen Nexus 7 users will have to wait a bit more until the new dessert reaches their devices, they should enjoy it soon enough. Of course, for those of you who don’t want to wait that much until they receive the official Android 5.0 Lollipop update, there’s always the option of using a factory image, as soon as they’re available. Can’t wait for the official Lollipop? Like each time a new update is released, a great source for information about how to manually upgrade your Nexus to Android 5.0 Lollipop is Android Central. Check out their guide, where you can find all the information required for this process. So, who’s excited to get a test of the new dessert? Are you already checking for the update?